The subject of salvage title vehicles is, believe it or not, a relatively interesting one. A salvaged car is one that an insurance company has determined will cost more money to repair than a high percentage that the car itself is worth (percentage thresholds vary by state). Car lovers, especially those that enjoy doing serious repair work on them, can talk about salvaged cars all day long. Really, what’s more fun than bringing a vehicle that’s been totally written off and headed for the junk pile back from the dead and into perfect running order? (I can think of a lot of things, but then again, I’m not a mechanic). But there are many issues that must be resolved in order to take a salvaged diamond-in-the-rough vehicle from the junk heap and return it to the street, and one of the most important has to do with titling. Once an insurance company has deemed a vehicle a total loss, its title will be “branded” as salvage (hence the term “salvage title”). Fortunately, that’s not the end of the discussion. Here’s why. Before we begin, it's important to note that attempting to conceal a car’s history in a way that isn’t totally “by the book” in your particular state is a serious crime called title laundering. Every state’s auto licensing regulations are different and you should always check the unique registration requirements and titling rules of your state before considering a salvage title car. The rules are fairly similar in most jurisdictions, though, and they work something like this. Once a vehicle’s title has been branded as salvage, it will never go back to the way it was titled before. In most states, however, the title can be re-branded as “rebuilt salvage” (or in some places “reconditioned” or “assembled”). This will, of course, require that you repair the vehicle and submit it to the DMV for inspection. If it passes snuff, the DMV will re-brand the title as “rebuilt”. So, I suppose you could technically say that the salvage title has been removed. But only technically. Anyone who knows anything about vehicle titles (and car history reporting services) will see the word “rebuilt” and know that it means it was formerly branded as salvage. That includes, by the way, all insurance carriers and any knowledgeable potential buyers. If that’ a big problem for you, then skip the salvage game. If not, read on. This may or may not be as simple as it sounds. Some states will only allow licensed rebuilders to purchase or own a salvage title car. If that’s the case in your state, you will only be able to own the vehicle once it has been repaired and gone through the inspection and re-branding process. 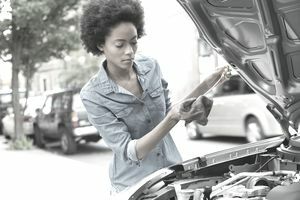 Make sure that you know what you are doing or have the vehicle repaired by a certified mechanic who does. Also, make sure to hold on to any and all paperwork on the vehicle and take lots of pictures before and during the repair process. Obtain and fill out the necessary forms from the DMV to have the car inspected. This is where all of that paperwork and those photos come into play. The DMV will most likely require that you submit your bill of sale, the salvage title, the photos, and other documentation as part of the process. Once you’ve handled the paperwork, schedule an inspection and get the vehicle inspected. Remember, you cannot legally drive the vehicle to the inspection facility, so you will likely have to have it towed there. Once it has passed the inspection (and you have paid the inspection fees), the inspector will attach a decal to the vehicle indicating that it has passed. Your next move will be to apply for the re-branded title, which will require filling out more forms and paying more fees. You should then receive the title with a statement branded on its face indicating the vehicle has been rebuilt. One more potential issue: If your vehicle received its salvage title in another state, you may have to have it inspected and re-branded in that state before you can register it at home. Again, check your state’s regulations before making your purchase.